Your career with FUCHS LUBRITECH - Explore your specialties. Expand your possibilities. For all those who are curious to explore what is possible based on talent and drive, FUCHS LUBRITECH is the ideal growing ground to nurture your capabilities, your ideas and your career. Regardless of your professional track record or your previous experience, you are welcome in a team, which will support you - and at the same time will grant you the freedom to find your own way to try bold new things. We face our challenges together. As a team we find new ways to bring our expertise together to share knowledge and to inspire each other. 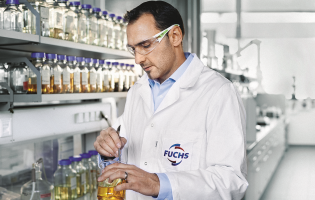 FUCHS is the number one choice when it comes to lubricants and related specialties. We are always curious to find and to explore niches where we can excel. It's not only about the way our products work. It's the way we think. We are focusing on our individual talents and capabilities and letting them grow together within a great network of people who are always trusting and supporting each other. This is how we work. This is how we expand our business. This is how our employees can expand their possibilities.